Points Needed: 23800 Software is not compatible with mobile and tablet devices. Please add this title to your Wish List and sign on to your the first club account from a desktop computer to complete your redemption. ABOUT THE SOFTWARE Design your own business cards, flyers, brochures and calendars. 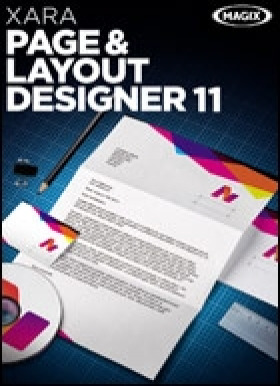 With MAGIX Page & Layout Designer 11 you can create all the printed material you need, from your logo, business cards and an appealing company or organization presentation to flyers, posters, and brochures. Simply select one of the many professional templates and customize to your liking. KEY FEATURES	Profes… sional, royalty­free design template sets Advanced options for text layout Format text quickly Image optimization for brilliant photos Create your own logos Magic Snap: Auto­arrange items Support for CMYK, HSV, and Pantone color systems More secure data exchange with PDF/X support All relevant formats are supportedSYSTEM REQUIREMENTS	For Microsoft Windows Vista / 7 / 8 / 10All MAGIX programs are developed with user­friendliness in mind so that all the basic features run smoothly and can be fully controlled, even on low­performance computers. The technical data for your computer can be found in the control panel of your operating system. Processor: 700 MHz or higher RAM: 512 MB Hard drive space: 300 MB available space Graphics card: Onboard, min. resolution 1024 x 600 Internet connection: Required for registering and validating the program, as well as for some program features. Program requires registration. Optional: Burn CDs/DVDs with a CD/DVD±R(W) burnerSupported formats: Import: JPEG, PNG, GIF, BMP, TIFF, PSD, PDF, PDF/X, AI, EPS, CDR (CorelDraw 3, 4 & 5), ICO, DCM, XAR, XPS, DOC, DOCX, RTF, ODP, PPTX, HTML and others Export: JPEG, PNG, GIF, BMP, TIFF, PSD, PDF, PDF/X, AI, EPS, SVG, XPS, DOC, DOCX, RTF and others Copyright © MAGIX Software GmbH, 1994­2015. MAGIX is a registered trademark of MAGIX GmbH & Co KGaA. MAGIX licensing conditions are made clear in the installation process and can also be found at www.magix.com under EULA. Other mentioned product names may be registered trademarks of the respective manufacturer. The represented texts, graphics and photos are only intended to provide information about MAGIX products and contain copyright­protected material. Reproduction and distribution of this material is therefore not permitted and shall require the express permission of MAGIX.